It has been requested that the title of this article be changed to Spygate (2016 United States presidential election). Please see the relevant discussion on the discussion page. The page should not be moved unless the discussion is closed; summarizing the consensus achieved in support of the move. Spygate is a conspiracy theory initiated by President Donald Trump in May 2018 that the Obama administration had implanted a highly paid spy very early in his 2016 presidential campaign for political purposes. On May 22–23, 2018, Trump made these assertions, without evidence, adding that it was done in an effort to help Trump's rival, Hillary Clinton, win the general election. He said this person was paid a "massive amount of money" for doing so. 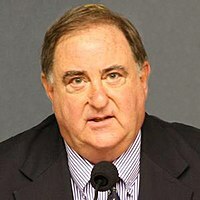 Stefan Halper, a longtime, paid, FBI informant, had approached separately three Trump campaign advisers in 2016 in a covert effort to investigate Russian interference in the 2016 United States elections, but as of April 2019, no evidence has surfaced that he had joined Trump's campaign or acted improperly. On June 5, 2018, Trump further alleged that a counterintelligence operation into the Trump campaign had been running since December 2015. The House Intelligence Committee, then in Republican control, concluded in an April 2018 report that the FBI counterintelligence investigation of the Trump campaign began in late July 2016, while the February 2018 Nunes memo written by Republican aides reached the same conclusion, as did the February 2018 rebuttal memo by committee Democrats. High-ranking politicians on both sides of the aisle, as well as Fox News personalities, have dismissed Trump's allegations as lacking evidence and maintained that the FBI did nothing improper. Trump's claims have been shown to be false. Trump has been involved in the promotion of a number of conspiracy theories which are lacking in evidence. These have included promoting Barack Obama citizenship conspiracy theories from 2011, claiming in 2016 that Ted Cruz's father was involved in the assassination of John F. Kennedy, and claiming that he would have won the popular vote in the 2016 election if not for "millions" of illegal voters. Trump also alleged in 2017 that his Trump Tower offices had been wiretapped, which his Justice Department has debunked. Max Boot, writing for The Washington Post, described Spygate as the latest example in a "nonstop" series of Trump's "nonsensical" allegations of a "Deep State" conspiracy against him, and that an earlier conspiracy theory Trump had advocated in January 2018 was that texts between FBI employees Peter Strzok and Lisa Page were tantamount to "treason", but the Wall Street Journal reviewed them and concluded they "show no evidence of a conspiracy against" Trump. In early February 2018, the Nunes memo — written by aides of Republican Devin Nunes, chairman of the House Intelligence Committee — confirmed that a tip about George Papadopoulos "triggered the opening of" the original FBI counterintelligence investigation into links between the Trump campaign and Russia in late July 2016. Later that month, a rebuttal memo by committee Democrats stated that "the FBI initiated its counterintelligence investigation on July 31, 2016". In April 2018, the House Intelligence Committee, then in Republican control, released a final report on Russian interference in the 2016 presidential election, which stated that the House Intelligence Committee found that "in late July 2016, the FBI opened an enterprise CI [counterintelligence] investigation into the Trump campaign following the receipt of derogatory information about foreign policy advisor George Papadopoulos". In March 2019, Nunes, the then-ranking member of the committee, asserted that it was "for certain" false that the FBI investigation began in late July 2016 as his earlier report had found, but media reports offered no further evidence or explanation from Nunes on this claim. On May 16, 2018, The New York Times reported the existence of a 2016 FBI investigation named Crossfire Hurricane tasked with investigating whether individuals within the Trump campaign had inappropriate or illegal links to Russian efforts to interfere with the election. Four individuals — Michael T. Flynn, Paul Manafort, Carter Page and George Papadopoulos — were initially investigated because of such ties. During the investigation, the FBI "obtained phone records and other documents using national security letters, a secret type of subpoena". The Times also reported that FBI agents, believing that Trump would lose the election, and cognizant of Trump's claims that the election was rigged against him, took extreme care and caution to keep the investigation secret as they feared that Trump would blame his defeat on the revelation of the investigation. Stefan Halper spoke to Trump campaign advisers, but there is no evidence that Halper had actually joined Trump's campaign. Although an FBI informant, Stefan Halper, spoke separately to three Trump campaign advisers – Carter Page, Sam Clovis and George Papadopoulos – in 2016 in an effort to investigate Russian interference in the 2016 United States elections, there is no evidence that Halper had actually joined Trump's campaign. Page said that he "had extensive discussions" with Halper on "a bunch of different foreign-policy-related topics", ending in September 2017. A former federal law enforcement official told The New York Times that their initial encounter at a London symposium on July 11–12, 2016 was a coincidence, rather than at the direction of the FBI. Clovis's attorney said that Clovis and Halper had discussed China during their sole meeting on August 31 or September 1, 2016. The New York Times reported that on September 15, 2016 Halper asked Papadopoulos if he knew of any Russian efforts to disrupt the election campaign; Papadopoulos twice denied he did, despite Joseph Mifsud telling him the previous April that Russians had embarrassing Hillary Clinton emails, and Papadopoulos bragging about it to Alexander Downer in May. After emails were leaked, Downer informed the FBI of his conversation with Papadopoulos, triggering the opening of the FBI's counterintelligence investigation into Russian interference in the 2016 United States elections. Papadopoulos was paid $3,000 by Halper for a research paper on the oil fields of Turkey, Israel and Cyprus. In April 2019, The New York Times reported that the FBI had asked Halper to approach Page and Papadopoulos, although it was not clear if he had been asked to contact Clovis. If the person placed very early into my campaign wasn't a SPY put there by the previous Administration for political purposes, how come such a seemingly massive amount of money was paid for services rendered – many times higher than normal ... Follow the money! The spy was there early in the campaign and yet never reported Collusion with Russia, because there was no Collusion. He was only there to spy for political reasons and to help Crooked Hillary win – just like they did to Bernie Sanders, who got duped! The Associated Press reported that Trump privately said that he wanted "to brand" the informant as a "spy" as using a more nefarious term than "informant" would supposedly resonate more with the public. Trump has not offered any evidence for Spygate when asked for it, instead saying: "All you have to do is look at the basics and you'll see it." In the May 22 tweets, Trump wrote that Halper, a longtime FBI informant, was paid a "massive amount of money" and concluded that he thus must be a spy implanted for "political purposes". However, the $1 million in contracts for “social sciences and humanities” research, some of which Halper subcontracted to other researchers, were signed with the Defense department's Office of Net Assessment between 2012 to 2016, with 40% of the money awarded before Trump announced his candidacy in 2015. It is unknown if the FBI paid Halper at all. Halper worked for the Nixon, Ford and Reagan administrations and continued as a State and Defense department advisor until 2001. He had been considered for an ambassadorship in the Trump administration. In the May 23 tweets, Trump published a false quote attributed to former Director of National Intelligence James Clapper that "Trump should be happy that the FBI was SPYING on his campaign." Instead, when asked "Was the FBI spying on Trump's campaign? ", Clapper said, "No, they were not." Clapper added that Trump should have been happy that the FBI was investigating "what the Russians were doing", and "were the Russians infiltrating" his campaign or trying to influence the election. On May 26, 2018, Trump questioned "why didn't the crooked highest levels of the FBI or 'Justice' contact me to tell me of the phony Russia problem?" NBC News reported in December 2017 that after Trump won the Republican nomination, the Federal Bureau of Investigation (FBI) "briefed and warned" him that foreign adversaries, including Russia, might attempt to spy on and infiltrate his campaign. Trump was told to alert the FBI of any suspicious activity. On May 25, The Washington Post wrote that several conservative sources have sided with Trump to embrace and promote Spygate, including the Fox & Friends talk show and political commentators Tucker Carlson and Sean Hannity for Fox News, the website Breitbart, and also radio show host Rush Limbaugh. Meanwhile, Infowars host Alex Jones took credit for coining the "Spygate" term. Asked on whether the promotion of the Spygate theory is meant to discredit the special counsel investigation, Trump's attorney Rudy Giuliani said on May 27 that the investigators "are giving us the material to do it. Of course, we have to do it in defending the president ... it is for public opinion" on whether to "impeach or not impeach" Trump. However, the December 2015 texts do not make any reference to the Trump campaign or Russia. This particular conspiracy theory promoted by Trump was traced by media outlets to originate from a Twitter user called @Nick_Falco, who on June 4 posted about the words "oconus lures" in December 2015 texts between FBI employees Peter Strzok and Lisa Page. While "oconus" refers to "outside the continental United States", Falco inferred that "lures" refer to spies. However, according to the United States Department of Justice, "lures" refer to "subterfuge to entice a criminal defendant to leave a foreign country so that he or she can be arrested". Falco questioned if "the FBI wanted to run a baited Sting Op using foreign agents against Trump", despite none of the texts mentioning the Trump campaign or Russia. Also on June 4, Falco's tweet spread to the r/conspiracy forum on Reddit, and also The Gateway Pundit, a far-right, pro-Trump website which has published multiple false conspiracy theories. The Gateway Pundit wrote an article entitled: "Breaking: Senate releases unredacted texts showing FBI initiated MULTIPLE SPIES in Trump campaign in December 2015". However, the texts referenced by Falco were publicly released by a Senate committee months earlier in February 2018. On June 5, Lou Dobbs of Fox Business said that "the FBI may have initiated a number of spies into the Trump campaign as early as December of 2015". Dobbs's interviewee on the show, Chris Farrell of the conservative group Judicial Watch, agreed that the existence of an "intelligence operation directed against then-candidate Trump" was "indisputable". Trump's June 5 tweet on Spygate came less than an hour after Dobbs's interview, with Trump also tweeting praise of Dobbs for the "great interview". After Trump made his June 5 tweet, Fox News described the news as "New Strzok-Page texts released", with Fox News television host Laura Ingraham saying: "It certainly appears they were looking to put more lures into the campaign in 2015." Republican Representative Ron DeSantis, a panelist on Ingraham's show, agreed that it was "clear" that the FBI investigation into Trump started earlier than July 2016. I am even more convinced that the FBI did exactly what my fellow citizens would want them to do when they got the information they got, and that it has nothing to do with Donald Trump...President Trump himself in the Comey memos said if anyone connected with my campaign was working with Russia, I want you to investigate it, and it sounds to me like that is exactly what the FBI did. I think when the President finds out what happened, he is going to be not just fine, he is going to be glad that we have an FBI that took seriously what they heard.... The FBI is doing what he told them to do. Senior Republicans including House Speaker Paul Ryan and Richard Burr, chairman of the Senate Intelligence Committee, supported Gowdy's assessment of the situation. Republican Representative Tom Rooney, who is on the House Intelligence Committee, chided Trump for creating "this thing to tweet about knowing that it's not true.... Maybe it's just to create more chaos." Republican senator Jeff Flake has said that the "so-called Spygate" is a "diversion tactic, obviously". while Republican senator Marco Rubio said that "it appears that there was an investigation not of the campaign but of certain individuals who have a history that we should be suspicious of that predate the presidential campaign of 2015, 2016". Representative Adam Schiff, the top Democrat on the House Intelligence Committee, has said that Spygate is "lie-gate", a "piece of propaganda the president wants to put out and repeat". He accused President Trump of repeatedly spreading baseless lies by quoting that "people are saying ..." or "we've been told ...". Michael Hayden, a retired general, former Director of the National Security Agency and former Director of the Central Intelligence Agency, said that Trump, through Spygate, was "simply trying to delegitimize the Mueller investigation, the FBI, the Department of Justice, and he's willing to throw almost anything against the wall". The allegations from Mayor Giuliani over the weekend, which would lead us to believe that the Trump people think the FBI had an undercover agent who finagled his way into Trump's campaign and was there as a spy on the campaign seem to be baseless — there is no evidence for that whatsoever. But this other allegation with this professor, whose name we're not supposed to mention, that is standard operating procedure in intelligence gathering and criminal investigations...I understand the president's frustration that he was not informed of the fact that his campaign was being investigated, not because they think the campaign did anything wrong, but some people may have unwittingly...welcomed the Russian involvement in the campaign, and Donald Trump didn't know about it.... [It] is such a stunningly unremarkable event, because law enforcement does this all the time. Jon Meacham, a presidential historian, has said, in regards to Spygate: "The effect on the life of the nation of a president inventing conspiracy theories in order to distract attention from legitimate investigations or other things he dislikes is corrosive." Aaron Blake, writing for The Washington Post, wrote that the "central problem" of the Spygate conspiracy theory is the "fact that these people who supposedly would do anything to stop Trump ... didn't". In the period before the election, the FBI "didn't use the information it had collected to actually prevent Trump from becoming president", as it did not publicly reveal it was already investigating links between George Papadopoulos, Carter Page, Paul Manafort and Russia. Rather, the reports before the election were that the FBI saw no clear link between Russia and the Trump campaign, instead believing that Russia was trying to disrupt the election without purposely trying to elect Trump. Steven Poole, writing for The Guardian, wrote that the real scandal was Trump using the "-gate" suffix for the issue, as the Spygate allegations are about "purely imaginary things". From May 31 to June 5, 2018, Quinnipiac University conducted a national poll of 1,223 voting Americans regarding the Spygate allegations. With the margin for error being 3.4%, a majority of 56% believe that the FBI's usage of a confidential informant was "routine procedure", while 33% agree with Trump that the FBI was spying on the Trump campaign. The only group of voters with a majority believing Trump are Republicans at 66%. The New York magazine addressed the June 2018 allegations by stating: "It's not surprising or scandalous that FBI agents would be using espionage tradecraft. Gateway Pundit seems to have invented the crucial factual element of the conspiracy out of thin air" while "Trump is citing right-wing conspiracy theorists who operate at a full level further removed from reality than the right-wing conspiracy theorists he customarily cites." Zack Beauchamp of Vox, which noted that "the FBI's investigation into Trump didn't open until July 2016", wrote about the situation which was "entirely unfounded in the actual evidence" occurred because "Fox picks up on some random internet rumor, the president picks it up from Fox, and then Fox and other right-wing outlets leap to defend what the president tweeted, which only reinforces Trump's sense that he's right." After reporting on both Trump's May 2018 and June 2018, Beauchamp wrote that the “best way to analyze 'Spygate' is ... a conspiracy theory ... a ginned-up controversy Trump has capitalized on to justify his argument that the FBI is hopelessly biased against him”. ^ a b Davis, Julie; Haberman, Maggie (May 28, 2018). "With 'Spygate', Trump Shows How He Uses Conspiracy Theories to Erode Trust". The New York Times. Retrieved May 29, 2018. ^ Aaronson, Trevor. "The FBI's use of informants is full of problems, but what happened in "Spygate" isn't one of them". The Intercept. Retrieved June 2, 2018. ^ Sollenberger, Roger. "The Short, Sad Life of Spygate! : Trump's Latest Conspiracy Theory Got Debunked by Evidence in a Matter of Hours". Paste. Archived from the original on May 31, 2018. Retrieved June 2, 2018. ^ a b Beauchamp, Zack. "'Spygate', the false allegation that the FBI had a spy in the Trump campaign, explained". Vox. Archived from the original on May 28, 2018. Retrieved June 2, 2018. ^ a b Tatum, Sophie. "Carter Page: I 'never found anything unusual' in conversations with FBI source". CNN. Archived from the original on May 23, 2018. Retrieved June 2, 2018. ^ a b Costa, Robert; Leonnig, Carol; Hamburger, Tom; Barrett, Devlin. "Secret FBI source for Russia investigation met with three Trump advisers during campaign". The Washington Post. Archived from the original on May 29, 2018. Retrieved May 29, 2018. ^ Chait, Jonathan (June 5, 2018). "Trump's Latest FBI Conspiracy Theory Is His Craziest Yet". New York Magazine. Retrieved July 27, 2018. ^ a b c Yen, Hope; Woodward, Calvin; Tucker, Eric (April 1, 2019). "AP Fact Check: Trump's exaggerations about the Russia probe". APNews.com. Associated Press. Retrieved April 2, 2019. ^ a b Qiu, Linda (May 21, 2018). "Trump Falsely Claims Russia Investigation Started Because of Steele Dossier". The New York Times. Retrieved April 2, 2019. ^ a b Philips, Amber (February 24, 2018). "Read the Democratic rebuttal to the Nunes memo, annotated". The Washington Post. Retrieved April 3, 2019. ^ Kessler, Glenn (June 2, 2018). "Fact check: Trump's 'spygate' claim is latest off-target salvo at Russia probe". Chicago Tribune. ^ Bump, Philip. "There is no evidence for 'Spygate' – but there is a reason Trump invented it". The Washington Post. Archived from the original on June 3, 2018. Retrieved June 1, 2018. ... we've seen this dance before: Trump whips up a conspiracy theory out of the ether and uses it to suggest that he is an unfair victim. He's never been terribly worried about backing up his assertions with facts; his claims about seeing Muslims in New Jersey celebrating the 9/11 attacks come to mind. He learned from that incident that he could make a false claim and that his base would throw up enough scaffolding around it that it could stand on its own. It's happened time and again, with Trump saying that something that didn't happen actually did and his allies scrambling for scraps of evidence that suggest it might have. So now it's Spygate. "We annotated the full Nunes memo on the Russia probe". PBS.org. PBS. Retrieved March 27, 2019. The memo underscores the intensifying partisan debate over special counsel Robert Mueller's probe into the Trump campaign's possible ties to Russia. ... The Papadopoulos information triggered the opening of an FBI counterintelligence investigation in late July 2016 by FBI agent Pete Strzok. Emmons, Alex; Aaronson, Trevor. "Nunes memo accidentally confirms the legitimacy of the FBI's investigation". The Intercept. Retrieved March 27, 2019. Despite rhetoric that could help to undermine Mueller's investigation, the Nunes memo specifically says that George Papadopoulos sparked the counterintelligence investigation that ultimately led to the resignation of National Security Adviser Michael Flynn, the firing of FBI Director James Comey, and the appointment of Mueller as special counsel. French, David. "The Big Flaw in the Memo". National Review. Retrieved March 27, 2019. Well, if the newly released Nunes memo is correct, House Republicans and the Trump administration just confirmed the Times' scoop ... Ironically enough, the memo in fact confirms the necessity of the Special Counsel Robert Mueller. Yuhas, Alex. "What is the Devin Nunes memo about and how does it affect Trump?". The Guardian. Retrieved March 27, 2019. The four-page document released on Friday is at the heart of a firestorm over Donald Trump, Russia and special counsel Robert Mueller. What's in it? ... the memo acknowledges that Papadopoulos, not Page, “triggered the opening of an FBI counterintelligence investigation in late July 2016”. Easley, Jonathan. "Memo: Papadopoulos info triggered FBI's Russia investigation". The Hill. Retrieved March 27, 2019. according to the memo released Friday by House Intelligence Committee Republicans ... Russia investigation itself — and by extension, special counsel Robert Mueller's probe — was launched from ... 'information' about Papadapoulos, rather than the dossier. Levitz, Eric. "6 Quick Takeaways From the Nunes Memo". New York. Retrieved March 27, 2019. But the memo doesn't just fail to discredit the investigation into the Trump campaign — it actually confirms its validity. The core of the GOP's argument against the Mueller probe has been that it was based on unsubstantiated allegations gathered by a Clinton operative. The memo suggests this might be true of the Carter Page warrant — but not of the broader investigation. Tucker, Eric; Jalonick, Mary; Day, Chad. "Trump claims memo 'totally vindicates' him in Russia probe". APNews.com. Associated Press. Retrieved March 27, 2019. Even as Democrats described it as inaccurate, some Republicans quickly cited the memo — released over the objections of the FBI and Justice Department — in their arguments that Mueller's investigation is politically tainted. A closer read presents a far more nuanced picture ... the memo confirms the FBI's counterintelligence investigation into the Trump campaign began in July 2016, months before the surveillance warrant was sought, and was “triggered” by information concerning campaign aide George Papadopoulos. ^ "Devin Nunes: We Are Ready to Submit First Criminal Referral for 'Falsely Claimed' Russia Investigation". Mediaite. ^ "Devin Nunes: I'm Sending Criminal Referrals Against FBI and DOJ for Russia Investigation". The Daily Beast. ^ a b Apuzzo, Matt; Goldman, Adam; Fandos, Nicholas. "Code Name Crossfire Hurricane: The Secret Origins of the Trump Investigation". The New York Times. Archived from the original on June 1, 2018. Retrieved June 2, 2018. ^ a b c d "Analysis | How the FBI informant's outreach to Trump staffers fits into overall investigation". Washington Post. May 22, 2018. ^ Fandos, Nicholas; Goldman, Adam (April 10, 2019). "Barr Asserts Intelligence Agencies Spied on the Trump Campaign". The New York Times. ^ Goldman, Adam; Mazzetti, Mark; Rosenberg, Matthew (May 18, 2018). "FBI Used Informant to Investigate Russia Ties to Campaign, Not to Spy, as Trump Claims". The New York Times. ^ "Papadopoulos brag to Australian diplomat was key factor in FBI's Russia probe: Report". NBC News. ^ Goldman, Adam; Savage, Charlie (April 9, 2019). "Justice Dept. Watchdog's Review of Russia Inquiry Is Nearly Done, Barr Says". The New York Times. ^ "Trump: 'SPYGATE' a scandal 'the likes of which this country may never have seen before'". CNBC. Archived from the original on May 23, 2018. Retrieved June 2, 2018. ^ Jalonick, Mary Clare; Lemire, Jonathan (May 24, 2018). "Seething over Russia probe, Trump tears into 'spygate'". Associated Press. Retrieved April 18, 2019. ^ Bump, Philip (April 11, 2019). "There's far more gray area on 'campaign spying' than Trump and his supporters present". The Washington Post. Retrieved April 18, 2019. ^ Fishel, Justin; Karson, Kendall; Khan, Mariam. "Trump claims 'you'll see it' when asked for proof of alleged 'spying' scandal". ABC News. Archived from the original on May 31, 2018. Retrieved June 2, 2018. ^ a b "Who is Stefan A. Halper, the FBI source who assisted the Russia investigation?". Washington Post. May 21, 2018. ^ Greenberg, Jon. "Online story gets details wrong about informant payment in Trump Russia probe". Politifact. Archived from the original on May 24, 2018. Retrieved June 2, 2018. ^ Correll, Diana. "Trump questions why FBI informant received payments from government". Washington Examiner. Archived from the original on May 27, 2018. Retrieved June 2, 2018. ^ "Stefan Halper". IWP.edu. Institute of World Politics. ^ "Exclusive: Peter Navarro pushed Stefan Halper for Trump job". Axios. ^ Kiely, Eugene. "Trump Misquotes Clapper on FBI 'Spy'". FactCheck.org. Archived from the original on May 31, 2018. Retrieved June 2, 2018. ^ Dilanian, Ken; Ainsley, Julia; Lee, Carol. "FBI warned Trump in 2016 Russians would try to infiltrate his campaign". NBC News. Archived from the original on April 23, 2018. Retrieved June 2, 2018. ^ Farhi, Paul. "'Spygate'? The mainstream news media has a few problems with that phrase". The Washington Post. Retrieved June 4, 2018. ^ Bach, Natasha (May 28, 2018). "'It Is for Public Opinion.' Rudy Giuliani May Have Admitted That Trump's 'Spygate' Is a PR Ploy". Fortune. Archived from the original on May 28, 2018. Retrieved May 28, 2018. ^ a b c d Chait, Jonathan. "Trump's Latest FBI Conspiracy Theory Is His Craziest Yet". New York Magazine. Retrieved June 7, 2018. ^ a b c d e Herb, Jeremy; Raju, Manu. "From Reddit to Trump: How the President latched onto a conspiracy theory". CNN. Retrieved June 7, 2018. ^ a b c Kight, Stef. "Go deeper: Digging into Trump's latest 'Spygate' tweet". Axios.com. Retrieved June 7, 2018. ^ "9-15.630 – Lures". United States Department of Justice. Retrieved June 7, 2018. ^ a b c Beauchamp, Zack. "Trump, Fox News, and Twitter have created a dangerous conspiracy theory loop". Vox. Retrieved June 7, 2018. ^ Hill, James; Bruggeman, Lucien. "'Oconus lures': Evolution of a conspiracy theory, from Reddit to the White House". ABC News. Retrieved June 8, 2018. ^ Foran, Clare. "Gowdy says FBI 'did exactly what my fellow citizens would want them to do' in Russia investigation". CNN. ^ "Gowdy on Trump's Spy Claims: I'm 'Convinced' FBI Did What Americans Would Want Them to Do". Fox News Insider. May 29, 2018. ^ Demirjian, Karoun; DeBonis, Mike. "Paul Ryan splits with Trump, says 'no evidence' FBI spied on president's campaign". The Washington Post. Retrieved June 7, 2018. ^ Cheney, Kyle; Bade, Rachael. "GOP congressman blasts Trump's spy conspiracy". Politico. Retrieved June 8, 2018. ^ a b "Trump's 'Spygate' is a 'diversion tactic': Senator Flake". Reuters. Archived from the original on May 28, 2018. Retrieved June 1, 2018. ^ a b Boedeker, Hal. "Rubio: FBI didn't investigate Trump campaign". Orlando Sentinel. Archived from the original on May 27, 2018. Retrieved June 2, 2018. ^ Samuels, Brett. "Top Intel Dem: This isn't 'spygate', it's 'liegate'". The Hill. Retrieved June 8, 2018. ^ Bort, Ryan. "Even Conservatives Are Realizing Trump's 'Spygate' Conspiracy Is a Hoax". Rolling Stone. Archived from the original on May 31, 2018. Retrieved June 1, 2018. ^ "Judge Nap: Giuliani Shouldn't Make 'Outlandish & Outrageous' Spy Allegations Without Evidence". Fox News Insider. May 30, 2018. ^ "Napolitano on Trump's 'Spygate' Claims: 'I'd Want to See Evidence Before I Made an Allegation That Outrageous'". RealClearPolitics.com. ^ Blake, Aaron. "The No. 1 reason Trump's 'spygate' conspiracy theory doesn't make sense". The Washington Post. Retrieved June 3, 2018. ^ Poole, Steven. "Spygate: why Donald Trump's use of 'gate' is a scandal". The Guardian. Retrieved June 4, 2018. ^ Wise, Justin. "Poll: Majority says Trump's 'spygate' claims not accurate". The Hill. Retrieved June 14, 2018. ^ "U.S. Voters Oppose Steel Tariff, Back China Levy, Quinnipiac University National Poll Finds; FBI Did Not Spy On Trump Campaign, Voters Say". Poll.QU.edu. Quinnipiac University. June 8, 2018. Retrieved June 14, 2018.